It’s been coming a long way, but we’re confident it was worth it: the new research system is finished. Actually you can try it out right now, since we’ve created a new public test server for it. All the information you need to access the PTS are at the end of this blog, but first let’s see what this is all about. Researching a kernel happens the same way as before: right-click, research. 1 kernel contains 1 RP (Research Point), but robots drop multiple kernels now. Every item in the knowledgebase requires up to 2 types of RP to unlock. Usually this means factional RP plus common RP, but for T4 items the common RP is replaced by hi-tech RP. Common technology uses only common RP, but double the amount (as if it were common+common), and hi-tech comes in for T4 items here as well (this is of course not doubled anymore, since it replaces one common part). Colony buildings use pure common RP for T1, common+hi-tech for T2, and pure hi-tech for T3. Robots have a 5x RP multiplier. After much consideration, we have decided for a 3x RP multiplier for the corporation tech trees. You cannot research kernels directly into the corporation RP pool. First you need to research kernels for yourself, then donate the points into the corporation pool. Donation is strictly one-way, there is no option to get back what you have donated. If you research an item in both your personal and corporation tech tree, that item will receive a production bonus. This bonus halves the material requirements when producing a prototype item (so a 5x material multiplier instead of the normal 10x), and adds a fixed 50 points material efficiency bonus when producing the item in a factory. Items receiving the bonus are marked with yellow text in the facilities. We have introduced 6 new complexity 1 research extensions, for each type of technology (Common, Nuimqol, Pelistal, Thelodica, Nian Industrial Trust, and Modular Private Colonies). 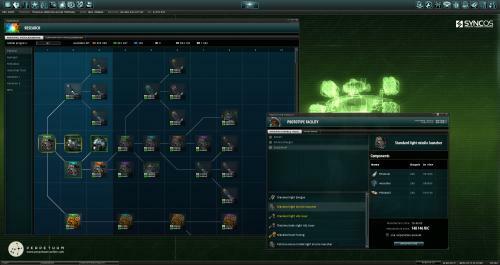 The tech trees in the knowledgebase are laid onto a 10-column grid, and each level of a research extension will allow you to unlock items in that column for the relevant rechnology (e.g. Research: Nuimqol technology level 4 enables unlocking items in column 4 of the Nuimqol tech tree). Researching in the corporation knowledgebase requires the same extensions, there are no separate corporation or CEO extensions for this purpose. We have a new Research access setting for corporation members, with 3 settings: none, limited, and full access. None means obviously no access at all to the corporation knowledgebase, it remains invisible for that member. Limited means the member can see and use the benefits of the corporation knowledgebase, but not spend RPs to unlock items. Full access means that the member can see and use the known tech, and unlock items. CEOs and Deputy CEOs have forced full access. Kernels on the market can be now found under "Industrial implements". We have determined the new Research Point cost of every item in the new system. During the patch we will take every character’s current knowledgebase with all its known tech, calculate the RP cost of all known items (including partially researched items’ cost as a percentage), and return the RP sum to that character’s available RP pool. This effectively means that you could rebuild the same knowledgebase you had before (provided you have the required extensions), if you wish to do so. We are aware that the new extension requirements could be an obstacle for some in achieving this, however we also feel that the ability to specialize and pick exactly what items you want to unlock compensates for this quite well. The drastic reduction in kernel types not only helps us in easier balancing, but should also revitalize the trading of kernels on the market, which has been hopelessly fragmented so far. During the patch we will convert all kernels in personal storages, corporation storages, robot cargos, and field containers to the appropriate number of new kernels. We will also have to cancel all sell and buy orders on the market for all kernels, since we can’t convert them while on the market (and their prices will likely drastically change too). Structure kernels will also cease to exist and won’t be available in the Syndicate Supplies store anymore. The new system uses Common and Hi-tech kernels for colony building research, and we’ll convert existing structure kernels to them as well. We’re introducing prototype variants for all standard robots, so it will no longer be possible to reverse engineer a standard robot. In order to produce a standard robot CT, you will have to unlock it in your knowledgebase, produce a prototype variant of it in the prototype facility, and then reverse engineer it. All prototype robots roll out with pure white paint. As mentioned, we do have a public test server for all the new stuff, so you can try it out and then we hopefully don’t have to make 3 server restarts and 2 rollbacks on patchday. 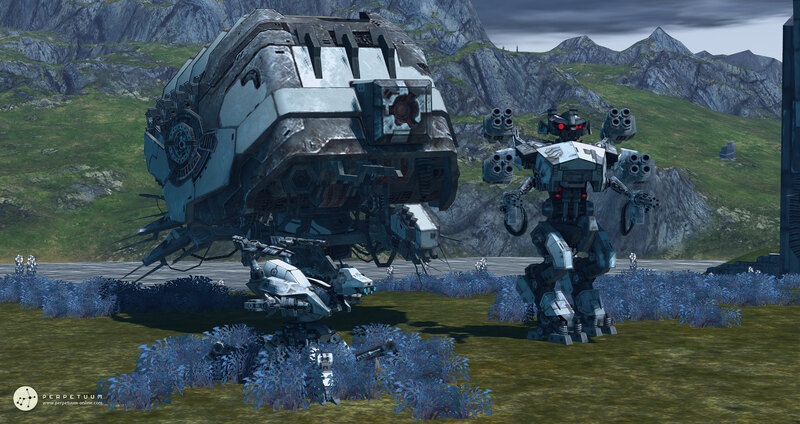 Now, our test server is only one lousy machine as opposed to the 3 beefy ones that run our live world, so initially there will be only one island active, New Virginia. If everything is smooth we'll activate a few more islands later, but testing the NPC->kernel->research->prototype->produce process should be doable on a single island too. We have copied over a recent snapshot of your accounts and characters, so that’s what you can log in with. However, since we’ll only have New Virginia, all characters have been transferred to TM Alpha terminal. That means you won’t be able to access your stuff that isn’t already there (or one of the NV outposts), but since every one of you received a gazillion of NIC, it shouldn’t really be a problem. Every account on the test server has also received an extra 300 000 EP for testing purposes. After it’s installed though, feel free to copy over your Local.gbf file from your normal installation so you don’t have to configure your settings and arrange your windows again. Testing will commence throughout the weekend and will end some time in the middle of next week. The plan is to deploy the patch to the live server towards the end of next week. That is all, see you on the test server, and thanks in advance for the help! Only on New Virginia? I'm calling green bias!!! Sounds interesting. Apart from the new research system, I like the Proto Robots. I guess the proto robots are the next (expensive) level to MK2? Protos are much needed step between MK1 and MK2 heavies. I tried kernel research on terrain and it works for me. Anyways great job Devs. Kernel research currently works on terrain, but it will be disabled due to the ghosting bug, which can't be resolved.